The air in your home is full of different substances, and there are always continuous spores floating around. While they normally have no harmful effects on your building, the right conditions could allow them to take hold and create dangerous black mold buildup. You can prevent some of the favorable conditions for mold on your own by opening window shades, operating fans and installing dehumidifiers, others might require intervention by experts such as basement waterproofing contractors. Penicillium is a green or blue growth usually found in areas damaged by water. Cladosporium is quite common and usually manifests as black or green dots in fabric and carpets. 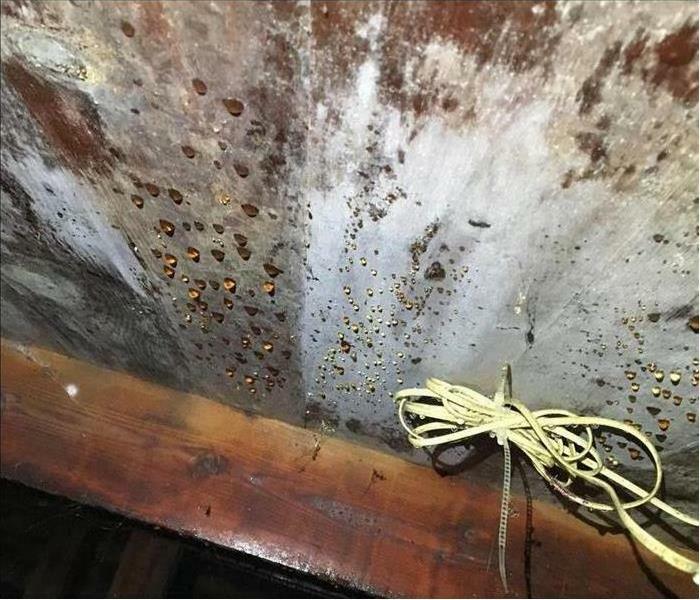 Stachybotrys chartarum, which is commonly referred to as black mold, forms in areas that are constantly wet, such as air conditioning ducts and around leaky pipes. It’s important to understand many species look alike, so contact a remediation specialist if you suspect growth in your home. Once black mold and other growths take hold, it can be difficult to contain their progress, which is why you should take action as soon as possible. Visit http://www.SERVPROlynnwood.com for more information on mold. Do You Have Mold in Your Crawlspace? Do you have problems with moisture in your crawlspace? Has a water leak caused mold, mildew or wood rot? Check for water leaks in the foundation walls and crawl space ceiling — make sure there are no cracks that allow water to leak inside the crawl space. While checking for cracks, be sure to also inspect the HVAC ducts and plumbing components for leaks. Ensure that the gutters and downspouts direct water away from your home’s foundation. Water that flows toward your house could enter your crawl space and basement. Make sure your crawl space is properly ventilated — for every 150 square feet of crawl space area, there should be 1 square foot of ventilation. However, consult a professional to determine if you should keep the crawl space vents closed and, if so, find other ways to control the humidity in the crawl space. Use plastic sheeting covers to insulate/encapsulate the crawl space floor and foundation walls. Vapor barriers like plastic sheeting covers trap the moisture that is evaporating from the soil and walls. If your crawl space is already insulated, inspect the insulation once or twice a year. Make sure the insulation is not missing or sagging, which indicates that there could be a water problem. Call SERVPRO of Lynnwood at 425-774-1148. Our trained and certified mold remediation technicians can diagnose your crawlspace moisture problem and get your crawlspace dried out in no time. Our technicians will remove any wet insulation in your crawlspace, treat the mold and mildew with an anti-microbial solution, dry the wet floor joists or subfloor, and remove and reset the vapor barrier so that you have no more problems of moisture damaging your home environment. Contact SERVPRO of Lynnwood for mold remediation services. Mold has had its fair share of controversy and sensationalism over the past few years. Despite the media frenzy quieting down, mold in home is still a significant and important issue for most homeowners. An increase in consumer complaints has resulted in homeowners engaging in mold remediation and cleanup process. A property owner's goal is to retain consumer confidence in home quality, safety standards, and home durability. In regards to mold in a home, there are two important factors to remember. First, you can prevent mold damage from your home by immediately addressing any of its manifestation. Second, use the proper protocol for mold mitigation. As a property owner should have a trusted team ready to respond if any issues arise. Below is a recap of five tips to help you create an effective mold removal plan. Tip # 1: Understand Moisture’s Role in Mold Formation. Evaluating mold in home infestation involves more than a visible check for mold growth behind wall, flooring, or in corners. For that reason, any commercial mold damage assessment requires analytical approaches. Understand that the presence of free moisture affects mold growth significantly. Secondly, familiarize yourself with how moisture originates and gets into your home. As a homeowner you must determine the sources of moisture in your property and use its presence to locate mold growth; SERVPRO of Lynnwood specializes in providing these services at competitive prices. Tip # 2: Create an Appropriate Remediation Plan and Documentation. Document your mold situation in writing, video, or photography. Documentation assists cleanup experts to develop an appropriate mitigation strategy. Details of the plan include what renovations or repairs are scheduled, necessary evaluation tests, or tenant relocation during remediation. A mitigation plan helps you manage liability and identify mold growth trends. As indicated before, growing mold in home can be deceptive, so it is necessary to determine the extent of contamination in your home. Determining your level of contamination influences the approach used in addressing mold damage within your home and lets you avoid exposing others to contamination. Mitigating mold growth involves a combination of various methods inclusive of Level 1 and Level 2 remediation practices. Both levels comprise the following listed steps: Fixing leaking plumbing. This approach significantly reduces mold growth, black mold, fungus, mildew as well as using deodorization to eliminate smelly odor. Isolate contaminated areas; this entails closing all windows and doors on contaminated doorways, and other access conduits. These help to avoid the spread of black mold, fungus, mildew, dry rot, and mold spores to other locations within the home as well as reduces smelly odor. Use misting and deodorization to reduce smelly odor caused by growing mold. Discard all mold-infected, black mold, fungus, mildew, dry rot, and other materials using appropriate disposal bags. Entrust the removal of contaminated material to a certified restoration company; such as the team at SERVPRO of Lynnwood. Ensure that you clean all wood surfaces and nonporous materials of any mold damage, dry rot, mildew, fungus, or black mold. Perform a visibility test. Inspect all infected areas of any visible contamination and mold debris, dry rot, black mold, fungus, mildew. Tip # 5: Evaluate the Mold Removal Plan The last step in this activity is determining whether the mold removal project achieved its objectives. Pay particular attention to any mold growth behind wall. You should implement a comprehensive mold mitigation strategy to avoid future issues. Visit http://www.SERVPROlynnwood.com for more information on our services provided. Restoring a home or business after water damage comes in many different forms. It can be as simple as vacuuming up water and leaving the room to dry, or as severe as reconstructing an entire flooded home from a pipe break or supply line break. Class 1: Little moisture has been absorbed by part of a room. Class 2: An entire room has been affected and water has absorbed into the walls and carpet. This is often from a supply line break or pipe break. Class 3: Water in a home or business completely saturated most of the area and walls, and may be coming through the ceiling. This is considered flood damage. Class 4: Materials in a flooded home such as stone, concrete, and hardwood require specialty drying due to severe damage. Category 1: Damage has been caused by a clean water sources such as a broken pipe or a supply line break. In order for mitigation to be effective, immediate action is required to lessens the risk of further damage caused by water in a business or home. Category 2: Flood damage is caused by “grey water” containing contaminates such as detergents or urine from a pipe break or supply line break. Category 3: Completely unsanitary water, such as that found in sewers or rivers, has caused the damage in a flooded home, and a bacterium has begun growing. The Process of Restoration Restoring a home or business to livable conditions generally involves water removal, decontaminating the area, and drying. In more severe cases, entire parts of the building may need to be replaced. The process is delicate and should only be handled by a professional restoration company. For more information on the steps involved, continue reading below. Step 1: Inspection – Getting a thorough inspection is the most important factor in mitigation with regards to water cleanup. Professionals will inspect the walls, floors, and ceiling and fit them into a class and category. This will be used to best determine a restoration plan. Step 2: Water Removal - Vacuums and pumps are used to remove water in a business or home, and the process must begin as soon as possible to prevent mold. Step 3: Drying – After all standing water is removed and absorbent materials are vacuumed, dehumidification and drying begins. This can take several weeks to complete. Step 4: Cleaning – Personal items such as clothing and drapery need to be sanitized to prevent mold and bacteria growth from water in a home or business. Step 5: Restoration – When there is severe damage from water in a business or home, materials such as walls, flooring, and broken pipes are replaced. When dealing with flood damage or general water damage it's always best to call a restoration company. They are specially equipped to handling water in a home or business, and will be able to act fast to prevent further damage. Visit http://www.SERVPROlynnwood.com for more information on water damage. 3/27/2019 - Do You Have Mold in Your Crawlspace?